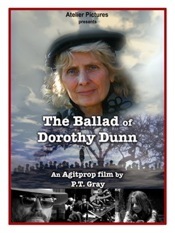 The Ballad of Dorothy Dunn - An independent film adaptation of the life of Christian activist Dorothy Day. 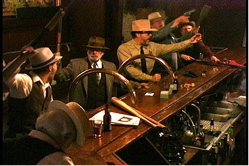 An agitprop music drama set in Steinbeck Country in California during the Great Depression of the 1930’s. 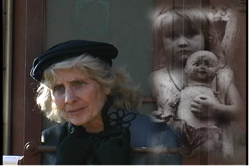 Gretchen Gray stars as Dorothy Dunn, an inspirational Catholic worker, a cross between Father Daniel Berrigan and Mother Theresa, as she seeks to steer a humanitarian course through the clashing rocks of the extreme political right and left during one of the most turbulent labor strikes in American History. Shocked by the mob lynching of a worker, she struggles to maintain her faith. The worker was the victim of vigilante mob justice. He was broken out of jail and lynched by a mob of 5000 without due process of the law. This action was supported by the Hearst press and by the Governor of California (certainly an impeachable offense had the ACLU been a viable force in the 1930's). The director, P.T. Gray, explores an original expressionistic narrative style to convey these themes. Devotees of independent filmmaking interested in an agitprop music drama that explores a new form of expressionistic narrative filmmaking. It should intrigue viewers interested in adventuring with non-traditional forms. Viewers may also want to check out Fritz Lang’s “Fury,” produced by Paramount Pictures in 1936, starring Spencer Tracy and Sylvia Sidney. 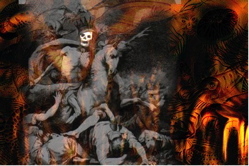 The expressionist film stylist drew his story inspiration from the same horrific real-life event as did “The Ballad of Dorothy Dunn.” Two different styles, two different approaches to story-telling, two different “takes” on the same event. History Buffs interested in revisiting 1930’s Steinbeck Country; in exploring the psychology of mob violence and vigilantism; and in tracing the roots of the violent right-left polemics which menace our own era seventy years later. Study groups interested in exploring the historical and societal issues prevalent at that time and place (Steinbeck Country, 1930's). A reading of John Steinbeck’s novel, “In Dubious Battle” will provide an interesting background for the film. Listening to Woody Guthrie’s legendary songs, dating from the period, will personify and offer insight into the essence of these issues. Faith based persons interested in experiencing the work of Dorothy Dunn, a Christian activist and humanist who had devoted her life to feeding the hungry and tending to the poor in a menacing world. The film tells of the story of an event that so shocked her, she lost her faith - but then experienced an epiphany that enabled her to regain it. The character, as admirably performed by Gretchen Gray, was inspired by the real-life Dorothy Day (1897-1980), the renowned founder of the Catholic Worker and fiery activist now on a path to being nominated for Sainthood. Persons and families who have roots in the Great Depression the economic and personal “earthquake” that deeply impacted the lives of so many Americans.